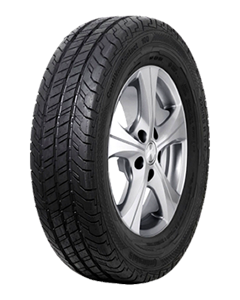 The new Continental Summer van tyre ContiVanContact 100. New wearoptimized compound for even longer service-life. Very economic thanks to excellent mileage performance and durable pattern. The ContiVancoContact 100 is an all-round talent that can not only easily cope with poor road surfaces and heavy loads, but which also offers a high mileage. Its specially reinforced carcass and sturdy sidewall, the stone-deflecting tread design, and the strong scuff protection strip on the sidewall make the tire a particularly robust load carrier. We have managed to reduce rolling resistance by 10% in comparison to the successful predecessor model – offering yet another advantage to transport companies who run Sprinters and similar vans and for whom speed and timeliness are the key in the distribution business. Continental has 14 sizes available with diameters ranging from 14 to 16 inches and load-bearing capacities up to a load index of 115 (1,215 kg per tyre). High level of efficiency thanks to higher mileage. Improved durability on all roads and therefore longer service life. High safety reserves for heavy loads. Trusted by leading car manufacturers; Fiat Ducato, Iveco Daily and Mercedes-Benz Sprinter come equipped with ContiVanContact 100 from the factory.